Take a sip of licorice tea and you’ll notice a strange lingering sweetness, as if someone secretly added sugar to your cup. This is due to glycyrrhizin, a sweetener which was used well before stevia entered the commercial market, but which works a similar way. People crave sweetness. Supposedly this is because we crave calories, but sweetness is an indication, not a guarantee. There are molecules that give us the sweetness of sugar, but without the calories. Lately, a lack of calories is considered more valuable than a surplus, and “sugarless” sweeteners have come on to the market. The most popular of them, stevia, come from the plant Stevia rebaudiana. It’s not, technically, sugarless. Stevia is a glycoside. A glycoside contains a sugar molecule, but it’s bound to another molecular structure, usually a hydroxy compound. Glycosides are often incredibly sweet when compared to plain old sucrose. A little glycoside goes a long way. Which is why glycyrrhizin, a keyboard-mash of a molecule, has been delighting anyone with a sweet tooth for centuries. It’s the glycoside in licorice. 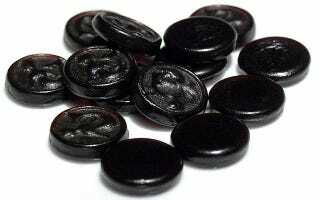 Most people’s experience with licorice comes from candy, which we expect to be sweet. But chew the root, or make tea from it, and the sweetness is still there. Glycyrrhizin has 170 times the sweetness of sugar, and it lingers in the mouth longer. It doesn’t have anywhere near the calories, it has anti-ulcer properties, and it also stimulates the production of cortisol, which means it reduces inflammation. It’s not all good. Too much cortisol pumps up blood pressure. It can be bad enough that health agencies ask people over forty to limit their daily licorice consumption. Glycosides can have side effects, some of which are tough to pin down. This is why some doctors worry about the possible side effects of consuming too much of these sweeteners, even though they are natural. Today, with an abundance of sugar and other “sugarless” sweeteners on the market, glycyrrhizin is no big deal. But before we could get sugar whenever we wanted, it made an ordinary plant into candy.